Get the most out of your camping experience with our range of canvas sleeping bags! Shop our massive range of products including doubles, king, biker and deluxe campers with a wide range of styles and colours. 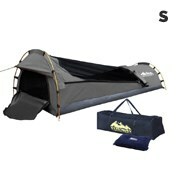 They provide you with a reliable and roomy shelter for all the seasons of the year. Features can include walls that are water repellent, rot-proof, UV resistant and mould resistant with a mesh doo mesh roof that provides excellent ventilation. Additional features can include PVC waterproof floor edges which prevents dew leaking in. Quality made and ensured materials including aluminium poles bringing extra strength and stability. They set up very easily with three aluminium poles pegs and guide ropes which make it easy on your bed-ready brain. 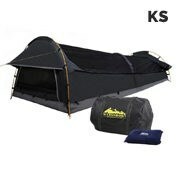 Excellent for all seasons, with this gear you’ll be doing more camping and less setting up! They are taller and have more foot space than other similar products in the market. 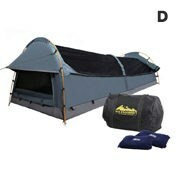 Our range has your camping needs covered, similar to our range of camping needs. These items including Tents, Camping Beds, Generators, Coolers, Cookers, Furniture, Lighting and much, much more! We work hard to ensure we provide you with top quality products for the best prices. We ship across Australia, including major cities like Sydney, Melbourne, Perth, Brisbane, Adelaide, Canberra, Newcastle and the Gold Coast. If you would like to learn more about any of our products or our store in general, feel free to contact us through our online form or call our customer service centre at (03) 9998 6805.